As the weather gets warmer, lenders are reminded that spring is quickly approaching, and with it comes the seasonal uptick in business for the mortgage and real estate business. Not only does the nice weather encourage people to go house-searching, but several thousands of people across the country begin new phases of their lives, graduating school, finding jobs, and moving to new homes. With this influx in the younger generation looking for houses, and more buyers beginning their mortgage searching process online, it becomes more and more important to have a strong online presence each year. Post your most current, accurate rates,. Provide borrowers with calculators and educational tools to help them make better home buying decisions. 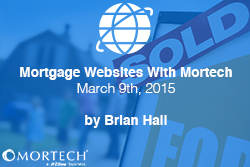 Mortgage websites are just another way that Mortech helps customers bring in more leads and close more loans. To schedule a free, consultative demo and find out everything that Mortech can offer you, just fill out this short questionnaire, and we can get you started.